ㆍTo foster and conduct rigorous research in the study of Scripture, both the Old and New Testaments. ㆍTo play a key role in building up evangelical interpretations of Scripture and in supporting world mission. ㆍTo publish resources and materials in support of biblical scholars, pastors, and seminarians in research and ministry. ㆍTo train the next generation of biblical researchers.In this endeavor, TTCBR currently facilitates several projects, including conducting academic seminars and major conferences, publishing a biblical studies journal, and supporting a biblical languages institute and an English colloquium for biblical scholars in Korea. TTCBR holds OT and NT seminars twice each semester, both for biblical studies students and for the larger seminary community. The seminars are open to all Torch Trinity students, faculty, and staff, including alumni/ae and guests of students and faculty. Special seminars continue in 2014 on textual criticism, interpretation of the OT, and other relevant issues in biblical studies. Periodically, TTCBR, in collaboration with other schools and research centers, plans to host and support major biblical studies conferences and lecture series with renowned biblical scholars from abroad. 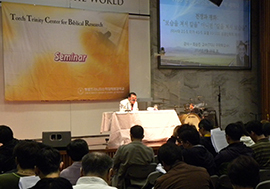 The purpose of these events is to encourage and inform biblical studies in Korea and in Asia. In May 2007, the first lecture series hosted Professor Anthony Thiselton of the University of Nottingham, England, renowned for his publications in biblical hermeneutics and most recently the definitive commentary on the Greek text of 1 Corinthians. Special lectures and seminars for Dr. Peter Enns (OT) from Westminster Seminary in Philadelphia, USA, and Prof. H. J. Bernard Combrink (NT) of the University of Stellenbosh, South Africa were held in 2008. In September 2014, Dr. Glen Taylor presented his article on the Psalms as a book about Jesus Christ as the suffering Messiah. TTCBR sponsors and facilitates a colloquium of scholars who see the need to develop publications in English to contribute to worldwide biblical scholarship. The group of like-minded Korean and international scholars meet six times a year, presenting papers and debating issues in the English language. These scholars are committed to rigorous biblical scholarship and to publishing the results of their research in English for the international setting. 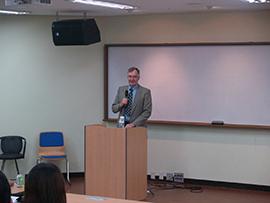 The purpose of the colloquium is to develop Korean and Asian biblical studies to participate and influence biblical scholarship outside of Asia. Every semester, TTCBR is opening bible lecture series for pastors and lay leaders who want to study bible more deeply, including our students and alumni. The institute encourages the learning and usage of the biblical languages, Hebrew and Greek, by organizing bible studies and reading clubs in the original languages. In addition, the institute offers formal and intensive elementary Greek, both in English and in Korean, during the summer and winter breaks for MDiv students or any interested persons in a safe and comfortable learning environment, using the latest textbooks and technology. The intensive course during the summer/winter is equivalent to a full year of undergraduate beginning Greek and lasts four to five weeks. The course is divided into two parts, equivalent to two semesters. Students may choose to take one part if they wish. The goal of the course is to guide students to translation proficiency of most NT texts with minimal help. The Institute for Biblical Languages has developed and administers the Greek Proficiency Exam, which is a prerequisite for Greek exegesis courses at Torch Trinity. The proficiency exam is officially offered at least four times a year and tests basic translation competency, vocabulary, and verb parsing. Exams for higher levels of language proficiency are planned in the near future for those preparing for doctoral-level studies, both in Greek and in Hebrew. All successful candidates receive an official certificate of proficiency and this record remains on file permanently with the Institute.